Just How Extreme Is Bullish Sentiment on the Stock Market? Home » Blog » $SPX » Just How Extreme Is Bullish Sentiment on the Stock Market? 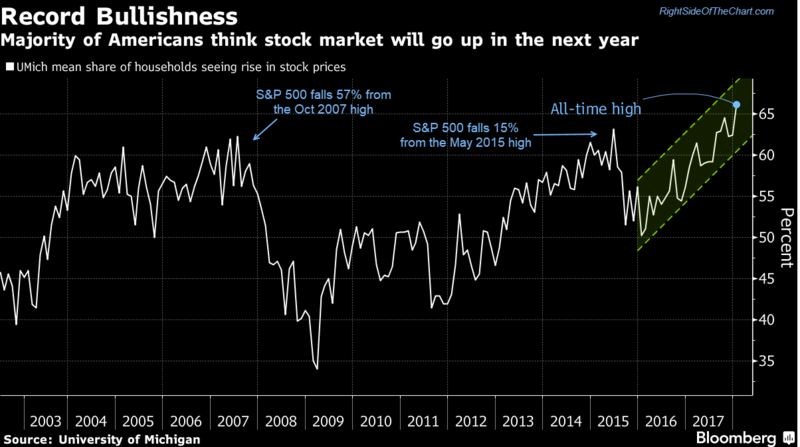 According to the University of Michigan’s survey, 66% of Americans believe that the stock market will continue to climb over the next year, the most optimistic reading in the history of that survey. Note the date & subsequent performance of the stock market following the two previous extreme readings. The chart below only shows the percentage of households expecting the stock market to rise over the next year, the S&P 500 is not plotted although the performance figures following the previous extreme readings are listed. I also monitor the AAII (American Association of Individual Investors) sentiment survey for extreme readings into what I refer to as the ‘red zone’. The bars on this chart show the spread between bullish & bearish market participants. 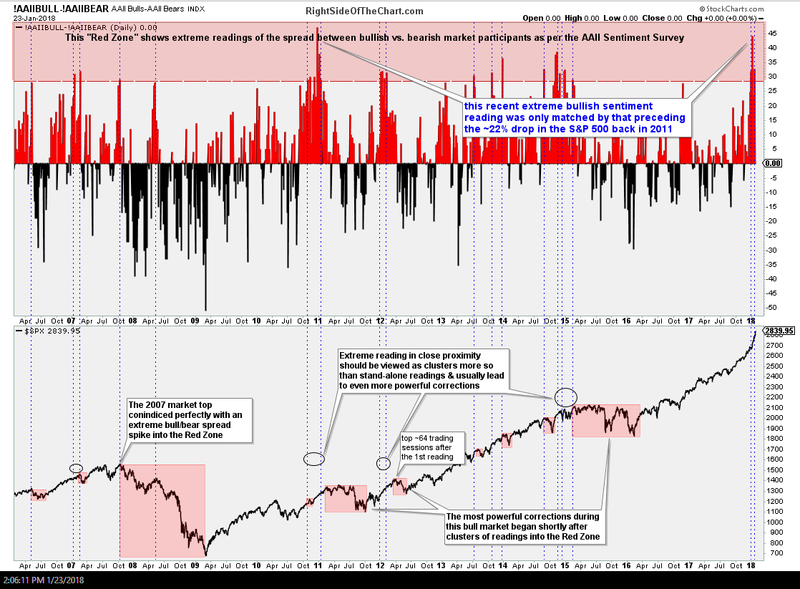 Extreme sentiment readings are considered contrary indicators as once an overwhelming numbers of market participants are bullish, there is nobody left (metaphorically speaking) to buy stocks as the majority of market participants are fully invested. Vice versa during periods of extreme bearish sentiment as many investors have thrown in the towel following a downtrend, leaving few potential sellers at that point with a lot of potential buyers (sitting in cash, bonds, etc..). This recent extreme AAII bullish sentiment reading was only matched by that preceding the ~22% drop in the S&P 500 back in 2011. I incorporate sentiment extremes into my analysis the same way that I factor on overbought & oversold conditions; they are not buy (or sell) signals, merely an indication that the current trend has most likely gotten ahead of itself and the risk for a correction (or rally) is elevated. I will then look for early signs of a potential trend change such as bearish (or bullish) divergences, buying (or selling) climaxes, candlestick reversal patterns, breakouts below (or above) trendlines & other key support (or resistance levels). Whether those sell signals come in the new few days, weeks or months, it is hard to argue from looking at the charts above that the risk of a substantial correction is building at this time. As such, I’ll continue to closely monitor the 60-minute charts for any early signs of a potential trend reversal while also keeping an eye on the more significant daily & weekly time frames. Just How Overbought Is The Stock Market? Check out the last 10 minutes of QQQ. Was dropping towards 169 and then in 1 minutes pushed up 30 cents back to 169.3. You really think they will allow it to fall? Other than a very large, bearish engulfing candle or series of bearish candles in the form of a high-probability reversal pattern, QQQ could fall over 1% right now with virtually zero technical damage done to the bullish trend. Even a drop of 10% from here wouldn’t inflict much, if any technical damage on the daily chart, assuming it was an orderly pullback. These extreme sentiment readings can get “more extreme” or they can start to abate now but still take weeks or even months to manifest in the form of a correction but with the recent near vertical ramp since the first trading day of the year, I suspect the reversal will be equally as swift once it sets in. Speculative accounts, such as hedge funds, have accelerated their buildup of net-long S&P 500 futures positions. Part of this is hedge funds unwinding their portfolio hedges (source: WSJ.com). That drastic reduction in hedging increases the risk of a flash-crash or at least a very swift correction. I have never seen an RSI like the hourly on XBI at 93. Everybody fears of missing out. Unbelievable. 1) Valuations are now higher that the 100 years preceded the final thrust of the dot.com bubble from 1998-2000. 2) Interest rates have (virtually) nowhere to go from here but up. Look at a 40+ year chart of interest rates (treasury yields). We are clearly at the end of a 36+ year secular bear market in interest rates. At the very best, rates stay this low for the next several years to come but odds favor that a new bull market in rates will begin soon or already has begun. The extreme valuations in the stock market now are being justified by the unnaturally low interest rates, which the Fed did to A) bail out the banks during the financial crisis and B) force money out of safe-haven fixed-income investments (bonds) into stocks in order to juice the market & thereby, bolster consumer confidence (which in turn increases consumer spending). The reason that I think the next bear market will be worse than those that followed the dot.com bubble in 2000 & the housing/credit bubble in 2007 is that for the first time in history, the Fed no longer has the options of embarking on an aggressive rate cutting cycle as they have done in the past to mitigate & attempt to stave off recessions. Not only do the effectively have little to no room to lower rates but as they still haven’t unwound their balance sheet after the massive & unprecedented bond buying from several rounds of QE in recent year, that option is very limited now as well. Bottom line is that the next bear market is likely to be much longer & potentially deeper than any in recent history. Until then, money managers are buying because they have no choice.They know, as we do, that valuations are at nose-bleed levels but as long as the general public keeps pumping money into their IRAs, 401ks, mutual funds, the fund managers must deploy those inflows into stocks as per their investment objectives & mandate (most funds are required to be close to fully invested with a minimal position in cash). Add to that is the fact that even IF they could go to 100% cash, in the cut-throat world of money management, they can not afford to underperform the market for long or they are out. When the tide turns (more outflows than inflows), there will be some tremendous profits to be made on the short-side and not just quick hit-and-run trading opps like we’ve seen over the last several years. Some time in the foreseeable future buy & hold or buy-the-dips will be replaced with short & sit tight as well as short-the-rips. Until then, the market will continue to party like it’s 1999.